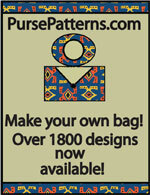 The Stow It All Tote Pattern by ChrisW Designs is a professional looking tote bag pattern with lots of pockets and clear instructions with photos. 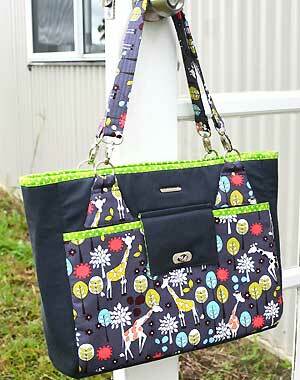 The Stow It All is a practical tote pattern - perfect for that day of shopping! There are lots of organizational pockets (including 5 outside! ), a twist lock pocket the perfect sized tote for a day out shopping, with plenty of pockets to keep organised while you shop! This spacious tote features 5 exterior slip pockets, 1 exterior twist lock pocket, a recessed zipper closure, an interior zipper pocket, two slip pockets and a pen pocket. Of course the addition of a twist lock, rivets (optional), bag feet, rings and cute hooks on the straps makes this tote look very professional! The finished size is 41cm W X 31cm H X 11.5cm D(16" W X 12" H x 4½" D) and this pattern is recommended for imtermediate sewers. 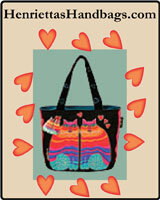 The Stow It All Bag Pattern has a total of 69 pages. There is a one page cover photo, a Table of Contents, 1 page of printing instructions, 1 page of test squares, 40 pages of instructions and photos, 15 pages of pattern pieces, and a bonus of 10 pages of text only (print them out to take to your sewing room! ).